Finding the best periodontist in Mississauga, Brampton, Oakville, and Burlington is easy when you choose Periodontal Associates. With our team of specialists in Periodontics and Implantology on your side, you can have confidence that we can deliver you with a smile that exudes confidence. We have a very multinational and multi gendered team at Periodontal Associates, and if you are looking for a female periodontist, our very own Dr. Quyen Su would be happy to assist you! In this article by Periodontal Associates, find out why we are one of the best periodontists in Mississauga, Brampton, Oakville, and Burlington! Why would you need periodontal treatment? – Moderate/advanced gum disease – This occurs when the gums are bleeding, swollen or red around most teeth and the jawbone has begun to recede. – Localized gum recession – The infection which promotes moderate or advanced gum disease often begins in one area. Gum recession may also be caused due to over brushing with a hard bristle brush, or due to a tooth that is not positioned properly. Immediate treatment is required to prevent further spreading. – For crown lengthening – A periodontist may lengthen the crown of the tooth by removing surrounding soft and hard tissue to provide more tooth exposure. – Ridge augmentation – This procedure, often called “recontouring” may be required to correct an uneven gum line. Before embarking on treatment, a periodontist needs to treat any bacterial infections and periodontitis. 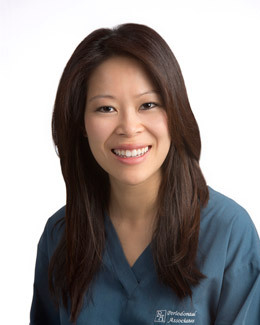 Meet our female periodontist: Dr. Quyen Su! When you are looking for the best periodontist in Mississauga, Brampton, Oakville, and Burlington, you should be looking for one that has many different cosmetic dentistry procedures administered by the industry’s best specialists. Dr. Su is a Canadian Board Certified Periodontist who offers comprehensive periodontal care and implant related therapy. She is very experienced and stays current with literature and periodontal treatments by attending local and international conferences. We are very pleased to have her as a member of our team at Periodontal Associates! When you are in need of cosmetic dentistry, do not hesitate to make an appointment at Periodontal Associates for the following services: Dental implants, Crown lengthening, Bone grafting, Ridge preservation, Bone regeneration, Bite adjustment, Chao Pinhole Technique, Frenectomy, Pocket Reduction Surgery, and much more! For more information about Periodontal Associates, and why we are one of the best periodontists in Mississauga, Brampton, Oakville and Burlington, please feel free to continue browsing through our website. We can be reached at 647-931-5349 or by filling out our contact form.